I'm oftentimes very critical of my work on this blog, as the material in it only encompasses a rather small percentage of what I would consider a full interpretation of price, and has yet to include some of the things that I look at the most on a daily basis; how to make very confident final decisions on when to actually pull the trigger on trades. This is probably the first of many posts which will cover the relationships of highs and lows, and price symmetry in general. By far, these two concepts, from a technical standpoint at least, are the most important things that I look at every single day. The relative positioning of highs and lows speak a tremendous amount about future price movements. I can't stress that enough. Next in line are the magnitude of price (steepness and degree of price movements) and tying them all together with price symmetry and our support and resistance levels. Anyone can find support and resistance levels, but how do we know which ones are safe to fade? The easiest answer I have for this question is to look at swing points one by one. If you're looking to sell on a 15 minute chart, look to see if you have lower lows, and when price takes out the high of your latest swing point and hits your area, and in a symmetrical pattern, sell it. If you're looking to buy, see that you have higher highs and follow the same routine. Don't worry of this seems cloudy right now; In the upcoming weeks I'm going to be posting a lot more about this because it is quite honestly bugging me to no end that I have yet to put up more materials on this subject. I have high confidence in knowing that these themes are going to help you tremendously, lest you're not familiar with them already. My biggest trouble with writing on this subject is how to best organize it, as all of these themes are tied together. So I'll go through examples one by one, starting with a move that occurred today. 1. First off, its Monday morning, so we had a gap today. EUR/USD opened lower than it closed on Friday. 2. Friday afternoon we had a significant rally in the pair; based on that I'm looking for this opening gap to get closed sooner than later. 3. Opportunity knocked at appx 7:10 GMT, when the short term trendline got broken to the upside. We had a double-bottom at 1.3622, so I had reason to believe this would continue. Had 1.3622 been passed to the downside, I would have been much more weary of going long. But it didn't. 5. After I draw Trendline B, I attempt to mimic the trendline, but on top of price, at the same angle. Knowing full well that most of the time, the angle on top will be steeper than the one on the bottom. This is just a common-case. But either way, I find points to connect Trendline A in some very obvious areas. In it goes. 6. Trendline C gets steep; price is racing and overall looking good for the long trade; but I know at one point we're going to get a deeper cut of this move. 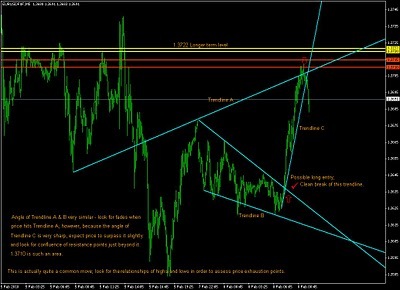 I look at the top of Trendline A, and look for major resistance points directly above or at it. Having this upper trendline taken out slightly is all too common when you have steep price action leading up to it. 7. My eyes draw in on a local high in the downtrend made on Friday at 1.3710 (combined with last Thursday's daily low at 1.3712), and 1.3720, which is in semi Quasi-pattern mode and has excellent confluence with a longer term level. 8. Looking to scalp short only at this point, I decide that 1.3720-25 is too far ahead, so I go for the lower area instead, tucking a stop just above these major highs. Additionally, this 1.3710 area is usually a very good setup – going off of bumps in the opposing trend is a very frequent move in general. The long is worth keeping on the meantime, as the daily trend is clearly now up and heaver levels have yet to get hit. Any major confirmation signals that this is going to reverse however, I'll be looking to get out. My next step is to simply monitor price when it gets into the longer term level range (1.3720-25), and see if we get fades or breakouts. Given the sharpness of this trend it could go either way, so I prefer to just sit and monitor in the meantime. Again, daily trend is up despite the fact that we're currently resting in a steep macro downtrend. Regarding the short scalp @3710, did you mean with “tucking a stop just above these major highs” above fridays high @3742? And secondly can you remember how you managed your long trade since price had come back to your entry level off the 3710 before it indeed reached your watching mark @3720-25. Just to let you know the link https://paracurve.com/2010/02/video-quasi-pattern-price-symmetry.html is not working (directed to 404 page), probably due to site migration. Thanks for the heads up – I’ll try digging for it – off the bat no idea what happened to that one.